In November 2017, The Budapest Times innocently accepted an invitation to a reception to celebrate the 34th anniversary of the establishment of the Turkish Republic of Northern Cyprus. They were kind enough to ask, and we were polite enough to accept. And we did so “innocently” because although we knew the issue of the divided Cyprus to be a political hot potato, we did not expect the bile poured upon us by a Greek Cypriot ambassador after he read our report of the event. Not having been there before, and having been threatened – sorry, advised – by the blue-in-the-face ambassador, we naturally accepted the invitation without a second thought. Anyway, his “friendly advice” must have been referring not to flying in directly, as your correspondent would do, but to crossing the “Green Line” border by land from the southern part of the island, his Greek Cyprus, to the northern part, his enemy, Turkish Cyprus. Since the Republic of Cyprus joined the European Union in 2004, there should be no hindrance to border crossings between the two parts of the divided island, in either direction. You just need to present your valid passport. Could the apoplectic ambassador really “inform the authorities” and offer such “friendly advice”? Perhaps we will try to find out when we get there. So, visitors to the Turkish side who fly in, such as from Budapest, must land at Ercan International Airport, while visitors to the Greek side enter via Paphos International Airport or Larnaca International Airport. The only problem for travellers to the northern side is that while there are direct flights from other countries into Paphos and Larnaca, the political situation on Cyprus means that only Turkish Airlines and the Turkish budget airline Pegasus fly into Ercan, and they only do so from a handful of destinations in Turkey, usually Istanbul. So visitors from Hungary, say, have to stop over for around an hour in Istanbul Atatürk Havalimani Airport to transfer to an Ercan flight. The political situation on the eastern Mediterranean island needs to be understood. By legend the birthplace of the ancient Greek goddess of love Aphrodite, Cyprus’s modern history has, in contrast, been dominated by enmity between its Greek Cypriot and Turkish Cypriot inhabitants. This enmity is sometimes dated back to Ottoman Empire times. Its forces invaded in 1571, holding the island until the early 20th century, giving rise to the Turkish speakers. Attempts by the island’s Greek-speaking population to join the Greek rebellion in 1821 were put down, fomenting a hatred of the Ottoman Empire among Greek Cypriots. Cyprus became a British crown colony in 1925, then gained its independence in 1960 after rising tension and guerilla warfare saw 371 British servicemen killed between 1956 and 1959. As well as freedom from British rule, many Greek Cypriots desired unification with Greece. Three Guarantor Powers – Britain, Turkey and Greece – declared the formation of the Republic of Cyprus on 16 August 1960, with Greek Cypriot Archbishop Makarios III elected the first president of independent Cyprus and Turkish Cypriot Fazıl Küçük the vice-president with extensive veto rights. The Cyprus constitution of 1960 guaranteed a degree of power-sharing between the two sides, but this broke down in 1963 as differences between the communities grew. Severe intercommunal fighting in 1963-64 resulted in hundreds of deaths and many people reported as missing. 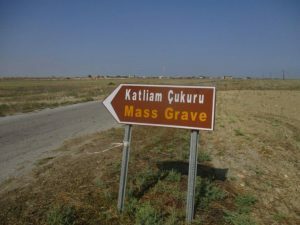 The majority of those killed were Turkish Cypriots, and many Turkish Cypriots were forced to leave their homes to live in enclaves. Distrust continued over the next decade and the two sides clashed again in 1974, after a Greek nationalist group, Eoka-B, led by Nikos Sampson, carried out a coup backed by the military junta in power in Athens. Sampson promised to unite Cyprus with Greece in so-called “enosis”. Thousands died in bloody violence and one-third of the population was displaced in the complete partition of the island. Both sides were accused of atrocities and/or human right abuses. This prompted Turkish troops to land in the north in two waves to take control of the northern and eastern 36.7% of the island, to protect its population and restore the constitutional order. Turkey justified its military intervention as a peace-keeping operation permitted under the 1960 Treaty of Guarantee, which provides that the three guarantor countries ensure the independence and sovereignty of the Republic of Cyprus. The Turkish Army has remained ever since, 40,000 strong, despite several United Nations Security Council resolutions, and the island is still separated, with an 870-strong UN peacekeeping force and a narrow buffer zone between the two ethnic groups, the “Green Line”. This runs through the heart of Nicosia, or Lefkoşa as it is known by Turkish Cypriots, the world’s only divided capital city. In 1983, the Turkish-held area declared itself a separate entity, the Turkish Republic of Northern Cyprus, a status that has been recognised ever since by a single country: Turkey. In 2003, Turkish and Greek Cypriots crossed the “Green Line” for the first time in 30 years after border restrictions were eased. The following year, Cyprus joined the European Union but did so as a divided island. All other governments and the United Nations recognise the Republic of Cyprus as the only legitimate government for the whole island. 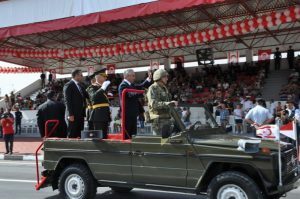 The Turkish Republic of Northern Cyprus remains an isolated entity to this day. Reunification talks have proceeded slowly and failed to make any progress, with each side blaming the other when talks fail, much to the chagrin of the Turkish Cypriots, who maintain that their will for a settlement is stronger. Key obstacles to a deal include the return of property to tens of thousands of Cypriots who fled their homes in 1974, as well as the presence of troops. It is to draw attention to this predicament, and hopefully speed a solution, that the Turkish Republic of Northern Cyprus has invited 37 guests from 15 countries to celebrations between 17-21 July 2018 to mark the 44th anniversary of their 20th July Peace and Freedom Day. These guests comprise 18 media representatives from Tunisia, Kyrgyzstan, Kazakhstan, Bulgaria, South Africa, Croatia, Zimbabwe, Moldova, Serbia, Qatar, Kuwait, Bangladesh, India, Pakistan and Hungary, the latter being the persona non grata from the evil The Budapest Times. The other 19 people are parliamentarians from Kosovo, Chad, Mauritania, Madagascar and, again, Hungary. This will offer “the opportunity to have a first-hand experience to explore political, historic aspects of the Cyprus question”, the invitation from the Deputy Prime Ministry and Ministry of Foreign Affairs Public Information Office explains. Our opportunity includes a visit to the Presidential Palace in Nicosia/Lefkoşa to hear and question the President of the Turkish Republic of Northern Cyprus, Mustafa Akıncı. President Akıncı opens by saying how Greek Cypriots maintain that Turkey had invaded and occupied in 1974, whereas the Turkish Cypriot side regarded the action as an intervention to protect the Turkish Cypriot population and prevent the island becoming a part of Greece. Turkey had been correct to do so as a Guarantor Power. The Turkish Cypriots want political equality for both sides, with identical powers and federal competencies, and will never be a minority in a Greek-led island, he says. The Turkish Cypriot side recognises it has a certain kind of international isolation but is working hard to minimise the negative effects. The Turkish Republic of Northern Cyprus has offices in more than 20 countries [including Hungary], it has 16 international universities with more to come, and 1.2 million visitors a year to enjoy its beaches, cuisine and historical sites. After the collapse of UN-sponsored reunification talks in the Swiss Alps last year, President Akıncı is now pinning his hopes on the imminent visit of a UN representative who will meet the two sides to see if they have had any further reflections on a mutually acceptable way forward. But Mr Akıncı does not appear to be confident. 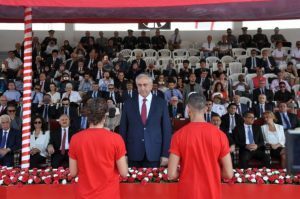 A major sticking point at the talks in Switzerland was the presence of the 40,000 Turkish military personnel on the island, and some of these participated in the official ceremonies and parade on July 20 to mark the 44th anniversary of their 20th July Peace and Freedom Day, a national holiday. 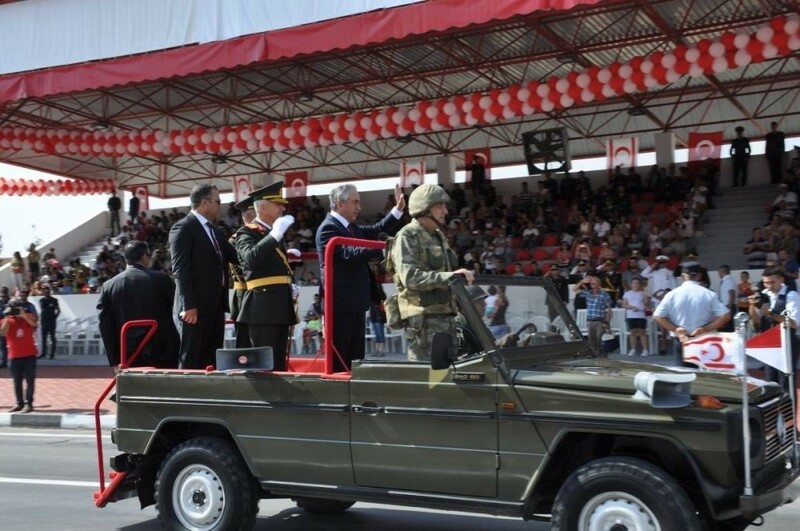 Tanks, armoured cars, rocket launchers, a field hospital and troops passed before President Akıncı and other dignitaries in the viewing stand. 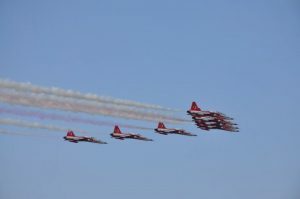 The Youth Office Folk Dancers performed and fighter jets of the Turkish Stars aerobatic team flew past in daring close formations. Apart from the parade, the armed forces were not really visible to the visiting journalists during their few days on the island. Neither were the United Nations troops, though we had glimpses of razor wire and warning signs along the buffer zone, and lots of bullet holes on a nearby building. The Ledra Palace, which once played host to Hollywood stars and the well-to-do and is now in UN hands, sits in the Green Line. Our itinerary was tight, and – apologies to any expectant readers – your correspondent did not find time to test the Greek Cyprus ambassador’s violent threat/friendly warning about attempting to cross over and back again. Another meeting was held between the visiting media and Gülfem V. Sevgili, who is Director of Relations of the Organization of Islamic Cooperation at the Deputy Prime Ministry and Ministry of Foreign Affairs. Mrs Sevgili says the intervention of 1974, which had been carried out in accordance with the 1960 Treaty of Guarantee, was to prevent the total annihilation of the Turkish Cypriots. Between 1968-1974, a Greek Cypriot onslaught had burned and destroyed villages and mosques. Hundreds had been killed, hundreds were missing and there had been kidnapping. The Budapest Times is not taking sides but absolutely wishes for peace on the island. It has been a long time since 1974. We do note that Greek Cypriots are happy to cross the Green Line to enjoy cheaper times in the north, buying petrol and clothes and visiting casinos and resorts because the Turkish lira is weak at the moment. 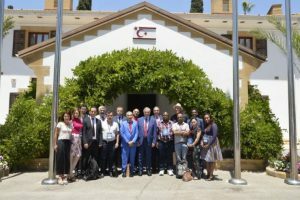 The Turkish Republic of Northern Cyprus went to considerable trouble and expense to invite the 35 guests to hear and spread its message. We listened with a sympathetic ear and reflected that, while the Turkish Cypriots presented their viewpoint and said they left us to form our own conclusions, our jolly Greek Cypriot ambassador has closed down communication and has not been heard from since his bristling attack.